Siobhan Logan is a Leicester based writer and performer providing talks, performances and workshops for a range of audiences. Her first book, ‘Firebridge to Skyshore: A Northern Lights Journey’, a collection of prose articles, travelogue and poetry, was published by Original Plus 2009. She has collaborated with auroral scientists from the University of Leicester on a sell-out show, the ‘Northern Lights Spectacular’, which premièred at London’s Science Museum and then the National Space Centre. It is also booked for the Ledbury Poetry Festival in July 2010. Working with poet Susan Richardson, she has formed the POLAR POETS, a duo bringing events about the Arctic to venues across the country in 2010/11. Siobhan’s poems and stories appear in various anthologies and magazines, including A Slice of Cherry Pie, A Tale of 3 Cities, Poetry Nottingham, The Journal and Tripod. One of her short stories, Bodywrapped, was choreographed by the Belgian dance company, Retina. Her poems have also been broadcast on BBC Radio Leicester. She is a member of several writing communities, including Leicester Writers’ Club, Leicester Poetry Society and Soundswrite. Her ‘day-job’ is teaching English at Leicester College. ‘Firebridge to Skyshore: A Northern Lights Journey’ published by Original Plus 2009. Poems and stories appear in various anthologies and magazines, including A Slice of Cherry Pie, A Tale of 3 Cities, Poetry Nottingham, The Journal and Tripod. Her poems have also been broadcast on BBC Radio Leicester. December ’06 Performance of ‘Colour Catchers’ poem sequence – ‘a play of lights and voices’ at Leicester Adult Education College. March 20th 2008 Performed my poems as part of an evening’s event on the Northern Lights at London’s Science Museum (Dana Centre). Sat. June 28th 2008 Presented show ‘Stories Drummed to Polar Skies’ at the Richard Attenborough Centre in Leicester. 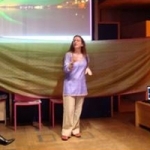 September 23rd 2008 Invited by the Science Museum, London to do repeat performance of poems at their Dana Centre for an evening about the Northern Lights. 9th February – school event with ‘Polar Poet’ by Bishop Ellis primary school, Thurmaston – performance, pictures and talk about the Arctic. July 24th 2009 ‘Stories Drummed to Polar Skies’ evening show – one of the headlining acts at Polyverse Poetry Festival at Loughborough University. Feb. 2010 ‘Northern Lights Spectacular’ show at the National Space Centre, a collaboration with scientists at Leicester University and film-maker Brian McClave. Have also provided talks and performances for a range of local groups, including Leicester Poetry Society, Botcheston WI and Leicester Astronomical Society. June 2005 Awarded Pg. Dip. in Creative Writing by Manchester Metropolitan University, after 2 year course in Novel Writing. August 2005 Short Story ‘The Black Dog’ won Commended prize in Leicestershire Libraries Short Story competition 2005. Sept 2005 Poem ‘Space for Sincerity’ got Highly Commended prize in Yorkshire Open Poetry competition and ‘Global Warming’ was placed as Runner-up by judge Michael Longley. Nov. 2005 Won Leicester Writers’ Club Short Story Award for 2005. Jan 2006 Poem ‘Windows’ appeared in Poetry Nottingham magazine, after winning Merit prize in Nottingham Open Poetry competition in September 2005. March 2006 Poem ‘Begettings’ won Highly Commended in Single Poem category in 2005 ‘the new writer’ competition. Later published in magazine The New Writer. March 2006 Prose piece, ‘Frog Island Lessons’ won 3rd prize in Three Cities Writing competition and published in Three Cities Anthology, along with another poem, ‘The Golden Mile’. May 2006 Shortlisted for Leicestershire Libraries Short Story competition with The Dead Walk Box story. May 2006 Short Story ‘Body Wrapped’ performed by Retina Dance Company at Leicester Phoenix Theatre, having been selected in an international competition as part of the ‘Eleven stories for the body, distance to our Soul’ production. May 2006 Poem ‘Auroral Football’ used in an exhibition by visual artist Jackie Stanley, at North Mill, Frog Island in Leicester. June 2006 Poem ‘A Stone’s Throw’ published in Current Accounts magazine, issue no 22 – won 3rd prize in Poetry section of Bank Street Writers Competition 2005/6. August 2006 Poem ‘Traffic Light Girls’ published in a chapbook anthology based on Twin Peaks TV serial, called A Slice of Cherry Pie, by The Private Press. Sept. 06 Story ‘The Dead Walk Box’ shortlisted in PCS/ WORDS magazine competition. November Story ‘The Chatterbox’ placed 3rd in Leicester Writers’ Club (LWC) Ghost Story competition. Nov. 06 Won Leicester Writers’ Club Annual Award for Poetry 2006. Aug 06/ Jan. ’07 Longlisted for Cinnamon Press Pamphlet Competition + poem ‘Northern Hides’ published in anthology Wherever. March 07 4 Colour Catcher poems published in ‘The Journal’ : ‘Seeing Red,’ ‘Fire-bridge to Sky-shore’, ‘Last Breath Singing’ and ‘Naming the Lights’. August 07 ‘The Chatterbox’ story was placed 2nd in the Leicestershire Libraries Short Story competition 2007 (won £100). Sept. 07 ‘Bodywrapped’ story accepted for publication in Tripod magazine. 15th November – won Leicester Writers’ Club Annual Short Story Award 2007. Dec 07 The Radio and Space Plasma Physics Group at Leicester University sponsored my trip to arctic Norway to research the northern lights and produce new writing and performance in 2008. March 13th 2008 poem ‘Neighbourhood Stoning’ was Highly Commended in LWC Poetry competition, adjudicated By Robert Hamberger. June 19th travel feature ‘Little Bombay Mix’ was Highly Commended by Nicola Monaghan for the LWC Local Writing competition. 11th Dec. Won 1st prize in LWC Travel Writing competition adjudicated by Richard Guise for ‘Night Fishing in Skjervoy’ travelogue. June 2009 Won first prize for ‘Found Song’ in LWC Poetry Competition, adjudicated by Alison Dunne. June 2005 Pg. Dip. in Creative Writing from Manchester Metropolitan University, after 2 year course in Novel Writing. June 1991 PGCE Teaching in FE qualification from Huddersfield University. 9th February – provided school event as ‘Polar Poet’ for Bishop Ellis primary school, Thurmaston (year 9 + 11 groups) – performance, pictures and talk about the Arctic.